Mighty Phallic Mystery Posts – What Do They Mean? They’re on every corner affected by the Cesar Chavez redevelopment. Any speculation on their purpose? 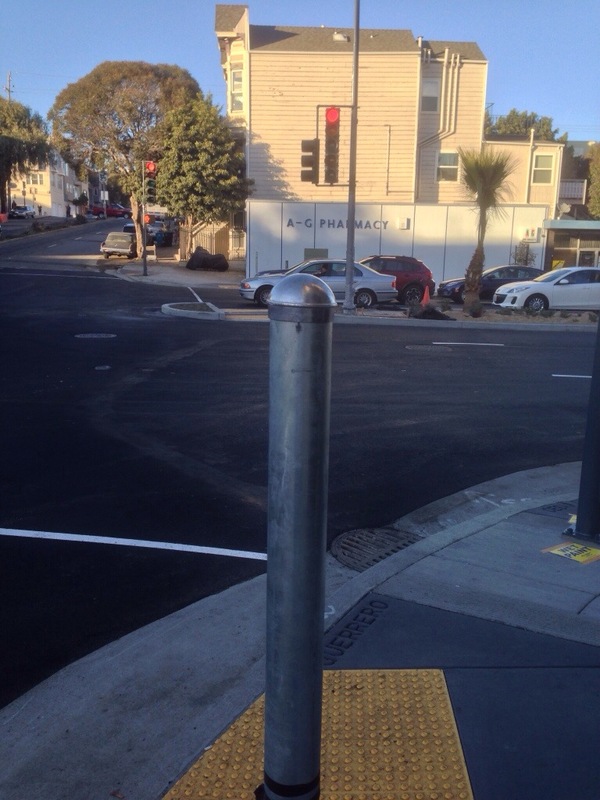 Crash bollards? Future pedestrian crosswalk buttons? NSA spying apparatus? What does the erection of these mighty metal phalluses in our neighborhood mean? Good question. I have wondered myself …. and when are they going to finish the pavement. I am sick of all the dirt. NSA/DHS spying devices are usually higher up, sometimes even integrated into streetlights. These look like something unfinished. I bet they will attach something to the top sooner or later.. hopefully it’s not a surveillance camera! I am still very intrigued by these poles. There isn’t one on my corner – some kind of clue? I notice they’ve been painted black. Does this signify something? Perhaps their intended purpose will soon be revealed!